We’d love your help. 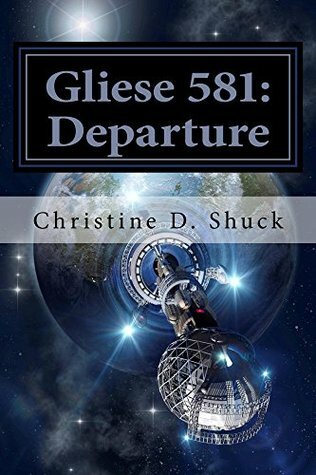 Let us know what’s wrong with this preview of Gliese 581 by Christine Shuck. In the final days of the 21st century, Daniel Medry and a crew of brilliant and talented scientists and researchers leave Earth on a mission to the Gliese system - the first extra-solar journey of its kind. Shortly after their departure, a terrible virus is unleashed upon Earth, highly infectious and nearly 100% fatal. Soon the colonists will learn that they are some of th In the final days of the 21st century, Daniel Medry and a crew of brilliant and talented scientists and researchers leave Earth on a mission to the Gliese system - the first extra-solar journey of its kind. Soon the colonists will learn that they are some of the last unaffected humans left. And if the challenge of establishing a colony on a distant alien world and re-creating the human race wasn't enough, someone on board is trying to kill them all. To ask other readers questions about Gliese 581, please sign up. It’s the later part of the 21st century, and our planet has all ready experienced a second Civil War. Monsanto has become EcoNu, and America is readying the Calypso, a space ship to take 250 top scientists to Zarunina’s world, a newly located planet identified as Gliese 581, where humans might live and start a new civilization. EcoNu hopes to conquer the pork market on Earth by introducing genetic viruses into pigs. The project goes awry after Calypso leaves the Earth for space, and the virus de It’s the later part of the 21st century, and our planet has all ready experienced a second Civil War. Monsanto has become EcoNu, and America is readying the Calypso, a space ship to take 250 top scientists to Zarunina’s world, a newly located planet identified as Gliese 581, where humans might live and start a new civilization. EcoNu hopes to conquer the pork market on Earth by introducing genetic viruses into pigs. The project goes awry after Calypso leaves the Earth for space, and the virus decimates the population left behind. It’s a Level 5 extension event, killing 99.95 percent of the population, which hasn’t occurred since the Permian-Triassic extension over 250 million years ago. Now it’s up to the men and women of Calypso to start that new civilization on a distant planet, if they can survive the voyage, while the 15 million survivors left on Earth try to repopulate the planet. And the virus in interfering with births at an alarming rate. The author did her research on many subjects, including viruses and their effects among world population. The story begins on the Calypso after someone has sabotaged the bay where 200 men and women rest in stasis. And if the system can’t be corrected, they will die. From there the story jumps back and forth to different people and places before the virus and after, and back and forth to the Calypso, also before the sabotage. Normally, I don’t like stories that jump around so much. It’s too easy to forget characters and why we met them in the first place, but the story line keeps the reader involved, and the pure immensity of the situation makes you want to learn more. This was a chilling prediction of what could actually destroy the human race, if we aren’t careful. I highly recommend this to fans of apocalyptic science fiction. You won’t be disappointed. The book is an interesting blend of genetic manipulation of DNA and issues with it running amok. Earth had already had a crisis and bioengineering was happening as the need for food was imperative...it was not meant to be a bad thing but..... traveling to the stars to start a new world allows for interesting characters. The author does a good job in making them very realistic. Worth the read. Neither one can ever touch each other again. The virus makes the old earth different from the new earth. They can talk across the stars, but can they ever be the same again? I loved this book. I can't wait for the next one! Great post-apocalyptic meets space colonization story! This book has everything I love, the thrilling thought of venturing into deep space to a habitable planet out of our solar system and the colonization thereof AND the excitement/horror of an extinction level event on Earth. This particular virus was something new as far as these things go from any books I’ve read and movies I’ve seen; very imaginative and all too frighteningly plausible if you ask me. I loved this for the same reason I loved Great post-apocalyptic meets space colonization story! What a great story! There are two major plot points going on here... one, a deep space colony ship is making its way to a planet that is (hopefully) suitable for mankind. Two, Earth is succumbing to a virus that will make certain that this is a one-way trip. The colony ship is not a generational-ark, but rather the crew is placed into hibernation, using a skeleton crew to simply to make sure things run smoothly during the trip. What they don't know is that someone (or something) wants to make sur What a great story! There are two major plot points going on here... one, a deep space colony ship is making its way to a planet that is (hopefully) suitable for mankind. Two, Earth is succumbing to a virus that will make certain that this is a one-way trip. The colony ship is not a generational-ark, but rather the crew is placed into hibernation, using a skeleton crew to simply to make sure things run smoothly during the trip. What they don't know is that someone (or something) wants to make sure they never arrive. The suspense is palpable during the ship scenes. And that cliffhanger ending... Wow! You can be damned sure I'll be reading the next book when it's released!